>> How to Move a Trampoline without Taking It Apart? Trampolines are exciting and fun additions to your backyard. They are the best ways of encouraging your kids and yourself to exercise in a fun and exciting manner. Most of the families are purchasing trampolines to keep themselves healthy and happy. Bouncing on a trampoline for a long period of time helps in relieving the stress and anxiety of a person. However, there are chances that you are shifting your house or you need to mow your trampoline without dismantling it. The best way in which you can move a trampoline is obviously by dismantling it first and then reassembling it in the new area where you want to place your trampoline. However, this is something that can be extremely time consuming and also, inconvenient. It is not easy to take the entire trampoline apart and set it back again. 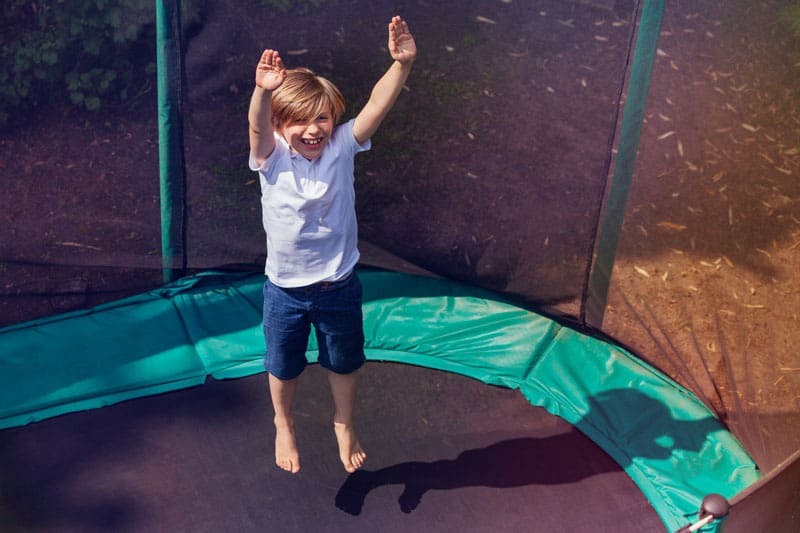 It takes a lot of time to set back your trampoline, and if you have been unsuccessful in assembling it for the first time when you purchased it, it is obvious that you will not want to go through the same process again. The easiest and most convenient manner of moving a trampoline without the use of extra pieces of equipment is by simply lifting it and moving it. However, this is possible only if you have a mini trampoline. If your trampoline is extremely large, it is apparent that it will be massive as well. In this case, you will require 4 to 5 people for lifting it up. But again, this is something that is not easy. If you do not have enough people surrounding you who will help to move a trampoline, then it is evident that you have to do it yourself. In case you are doing the entire thing by yourself, you can opt for the trampoline wheels. These wheels are available on the leading online shopping sites. The wheels are slotted on the legs of a trampoline. This will allow you to wheel your trampoline across the yard and place it in a suitable area. However, you have to remember that the wheels of a trampoline may not be appropriate for all the shapes and sizes. If you are using the trampoline wheels, ensure that you take them off before your kids or you start enjoying on the trampoline. In case, you leave the wheels attached, your trampoline might start moving, and it can lead to serious damage or accident. ​The trampoline wheels are expensive, but they can be of great help especially when you are planning to move the trampoline from one area of your house to another. You can mow your lawn easily when you move your trampoline. The wheels are available in different sizes to fit the trampoline of different shape or sizes. These can be installed easily without any hassle. These wheels make the work easy and a single adult can easily transfer the trampoline when you need to work on your yard. The only thing you gotta do is slipping the wheels under the trampoline's legs. After the wheels are installed, you can give a slight push to the apparatus, and you will see that it starts moving smoothly. In case you do not aspire to invest in the trampoline wheels, there is another quick and easy method that you can follow. If your trampoline is placed in your garden area or a lawn, you can try sliding your trampoline. To slide the apparatus, you have to apply WD40 under each leg of your trampoline. This will make it easy for the trampoline to slide. One disadvantage is that your garden or lawn can get a bit damaged because of the WD40. However, it will recover soon enough if you apply it in limited quantities. Applying it in large quantities will make it difficult for your lawn to recover. In spite of applying the WD40, you will require a helper who will assist you in shifting the trampoline to a different location in a safe manner. There are chances of getting hurt if you do it yourself. To conclude, moving a trampoline is one of the most difficult tasks as it is extremely heavy. If you are planning to mow the lawn area, it is best if you hire the professionals who can do the work easily. If not, try to mow around the frame of the trampoline instead of shifting it all together. However, if moving the trampoline is necessary, try the above methods to make the process easier and simpler.